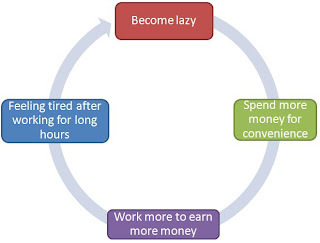 If you are lazy, more likely you will be in the vicious cycle as shown above. When you are lazy, you tend to spend more money for convenience. For example you may cab/taxi instead of bus/mrt, buying food nearby at a premium price for the sake of convenience. After spending unnecessary money, you may need to work more to earn more money to pay for your convenience. Since you are working for long hours, you tend to feel very tired after work. Since you are tired, you tend to be lazy again. i seriously like your chart. i, as an engineer, appreciate by looking at charts, flow diagrams, block diagrams. oh ya, u forgot, how do u think how to get out of this vicious cycle? I will be writing a post on how to get out of this vicious cycle. Please stay tune. i beg to differ. The solution to get ouf of this cycle is simply, be hardworking. OK, tat's just my guess. But sometimes you do have to pay more for convenience. For example, if you're working long hours, but you have no time to look after your baby at home. Do you employ a full-time maid or a part-time nanny? Does paying less gives you even more burden to handle? Since you are already struggling to cope at home, you will feel more stress at work.